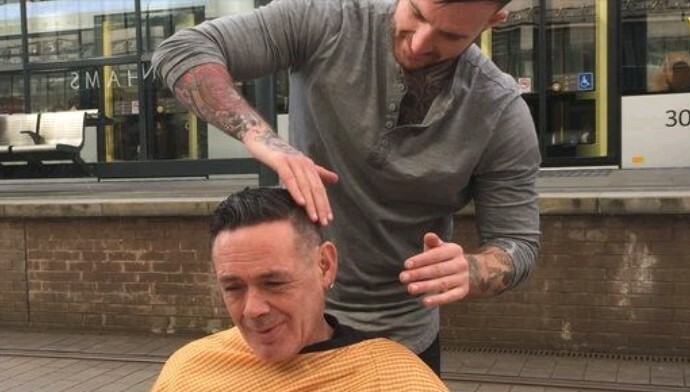 Ged King owns Skullfades barber shop in Sale and provides free haircuts and meals to the homeless and homeless ex-servicemen in Manchester. Ged has set up the Skullfades Foundation to provide funding for various projects in the community and so he can continue his work with the homeless. The funds raised will be used to aid the homeless through various different projects. Skullfades barber shop has been assisting the homeless in different ways. They give the homeless a free service that will hopefully give them more pride in their appearance, offer them support and inspire them to engage with other support services to build a more positive life for themselves. They also have a winter appeal and are looking for kind donations (particularly wooly hats and warm clothing) to donate to Manchester’s homeless community, especially as the weather is getting colder during these winter months. We have donated 50 pairs of JCB wooly gloves to an organisation called the Mancunian Tribe that Ged works with, in and around Manchester, in order to help the homeless. Even though Ged has managed to exceed his £5000 target and raise a massive £6,059, every penny helps. To help Ged continue to raise money for the homeless, please click here. For more information about the work that Ged does for the community, visit the Skullfades‘ and the Mancunian Tribe‘s Facebook pages.